It’s a well-known fact that memory fades as life progresses. But it can also be selective. Those of an age group in Donegal could not forget the great days of St. Joseph's in Donegal and Ulster football in the 1960s and 1970s. And in particular winning the All-Ireland Club Championship in 1968 against the powerful Dunmore McHales team containing so many of the Galway All-Ireland winning stars of that era. To this day I recall with pride how fortunate I was to be part of that great team and that special day in Donegal footballing history. Winning this inaugural All-Ireland Club Championship, unofficial competition or not, was the highlight of those years during which we won three Ulster Championships in 1966 against St John’s of Belfast, 1967 against Crossmaglen Rangers and later, with many new faces on the team in 1975, against Castleblayney Faughs. Surprisingly no other Donegal team has yet managed to win an Ulster Championship in the interim years. The All-Ireland final against Dunmore was played over two games in Bundoran and in Tuam. The first leg in Bundoran was a game of breathtaking skill from both sides with a high scoring rate of 3-11 to 0-14 to St Joseph's. It was described to me many years later in Letterkenny by the late Sean Curran of the “Derry People” as the greatest Gaelic football match he had ever watched. Sean would not have been known to dispense such largesse on St. Joseph's. In addition Galway legend Jack Mahon (RIP) recorded the return match as one of the best club games he ever saw. Certainly I never played in a better match of free flowing and entertaining football. It was a treat for the players and for the large attendance. But as this was a two leg final with scoring aggregate to count over two games the return match in Tuam was a huge challenge for St. Joseph's. Could we repeat the Bundoran performance? A wounded and determined Dunmore led at half-time and we left ourselves with some ground to make up. It took late goals from Peter Quinn (RIP) and Michael McLoone to clinch the trophy resulting in scenes of great jubilation from the fans who had travelled from Bundoran and Ballyshannon to support the team. I recall vividly my direct opponent both days being the legendary Galway player John Keenan, a brilliant player. Twenty years on I had the pleasure in renewing our duel, with less endeavour, in the special match organised in Ballyshannon on the 20th anniversary of our triumph. My St. Joseph’s partner at centre-field in both games was the classy Brendan Dowling. When in possession and looking to attack – unlike today’s football, it was then all forward progression - we sought to supply a brilliant combination of scoring forwards like Seamie Granaghan, Michael McLoone, Danny McHugh (RIP), Thomas Quinn, Kieran Blake and the emerging and youthful Martin Carney, all marshalled by the astute Peter Quinn (RIP). Such potent forwards saw us notching up 6-17 over the two legs! What games to play in and what memories never forgotten. There are many reasons why the St Joseph’s team were triumphant, not least the great team spirit, determined management, individual brilliance, the classy style of play added to the steely determination to overcome the odds when it mattered. The irony is that later in December 1968 we would lose our Ulster crown to our great rivals Bellaghy of Derry in terrible weather conditions in Dungannon. A game we should never have lost. As a consequence of these two games Bertie Coleman of Dunmore McHales and the Galway Co. Board was to propose that this championship get official status at the following GAA Congress. One additional memory I will not forget is that I did not travel back to Donegal from Tuam with the victorious team as I was lining out the very next day at outhalf for Athlone Rugby Club against Our Ladies Boys Club Galway in the Connacht Junior Rugby Cup final in the Sportsground in Galway. We lost! I missed the Bundoran/ Ballyshannon celebrations but shared the Athlone disappointment of losing to a Galway team in a different code. 1966 v St. John’s 1-10 to 3-3. Irvinestown. 1967 v Crossmaglen. 0-9 to 0-8. Casement Park. 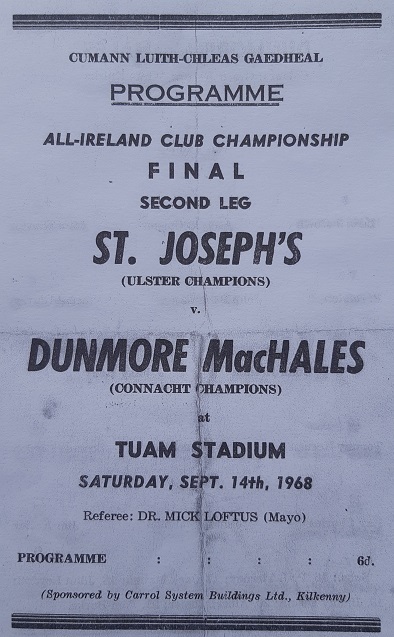 1968 v Dunmore McHales 3-6 to 3-10. Tuam. 1968 v. Bellaghy 0-5 to 0-8. Dungannon.